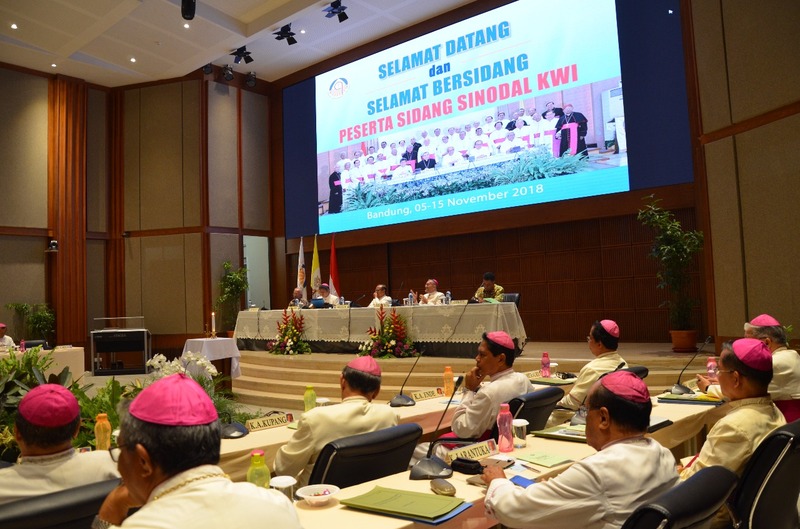 The prelates of the country’s 10 archdioceses and 27 dioceses are meeting in the West Java capital. For the archbishop of Jakarta, “The presence of the Catholic Church is sustained in spirit by the apostolic exhortation 'Gaudete et Exultate' of Pope Francis. 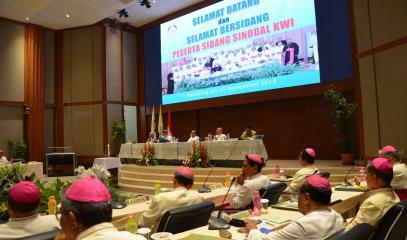 Bishops are essential to protecting national unity, Religious Affairs Ministry official says. 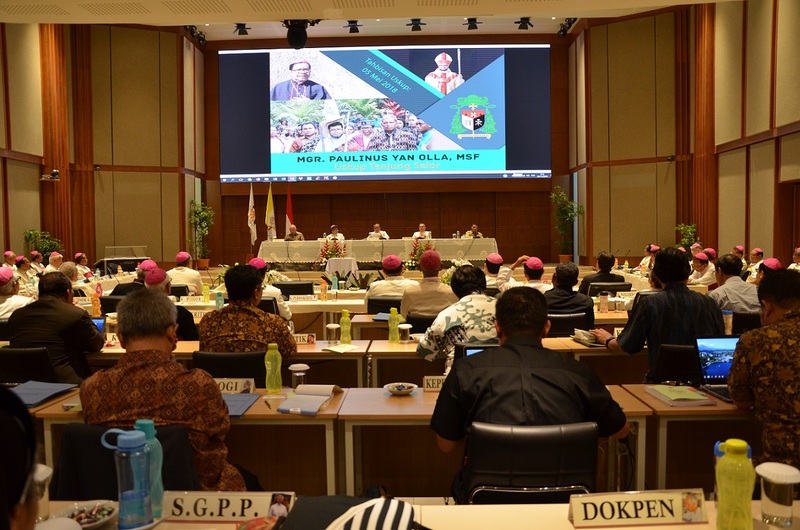 Jakarta (AsiaNews) – The annual assembly of the Catholic Bishops' Conference of Indonesia (KWI) is underway in the diocese of Bandung. Its theme is the ‘Church’s vocation in the nation – becoming a relevant and significant Church in the society’ with focus on human dignity, moral conscience and human rights. The gathering opened yesterday and is scheduled to last until 13 November. This year it is being held exceptionally in Bandung, the capital of West Java province since KWI headquarters in Jakarta are undergoing renovation. In addition to the prelates from the country’s 10 archdioceses and 27 dioceses, Archbishop Piero Pioppo, apostolic nuncio to Indonesia, attended the opening ceremony along with Eusabius Binsasi, director general for Catholic Affairs at the Religious Affairs Ministry; Rev Bambang H. Widjaja, member of the Synod of Protestant Churches (PGI); as well as representatives of the Association of Indonesian religious groups (Koptari) and of the Diocesan Association of Indonesia (Unio Indonesia). 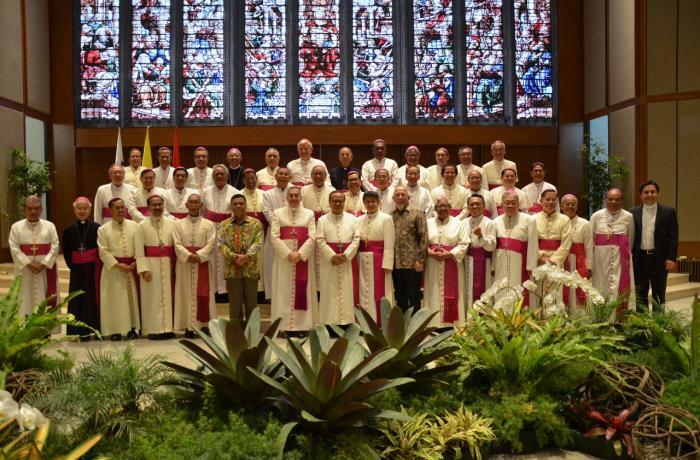 Yesterday, Mgr Ignatius Suharyo Hardjoatmodjo, archbishop of Jakarta and KWI president, listed the events that marked the life of the Church in recent months, such as the first edition of the Pesta Paduan Suara Gerejani (Pesparani), the national festival of Catholic sacred music; the appointment of the new bishops to the dioceses of Tanjung Selor (North Kalimantan), Maumere (East Nusa Tenggara) and Purwokerto (Central Java); and the many cases of corruption and government mismanagement that have affected national politics. "The presence of the Catholic Church is sustained in spirit by the apostolic exhortation 'Gaudete et Exultate' of Pope Francis, which affirms that the Church is called to reach her perfection, despite all the distractions," said Mgr Suharyo. Eusabius Binsasi reiterated the authorities' call to maintain good relations with all the components of the nation, ahead of next year's parliamentary and presidential elections. "Despite the many differences,” he said, “we protect our national interest together: unity in diversity. To this end, the bishops are essential." Pastor Widjaja stressed that "Church leaders must work together and respond to the key issues that touch the country, especially political issues." Lastly, Archbishop Pioppo noted that in 2019 the Indonesian bishops will be in the Vatican for their ad limina visit with Pope Francis. 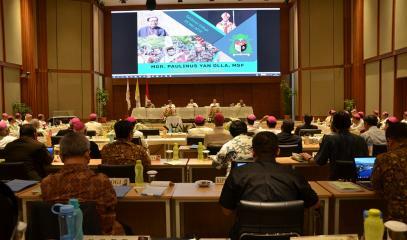 "Let the testimony of the fruitful results of the pastoral mission in Indonesia become strong hope,” said the nuncio, “and reaffirm the contribution of the national Church to peace and social harmony in this fertile country".